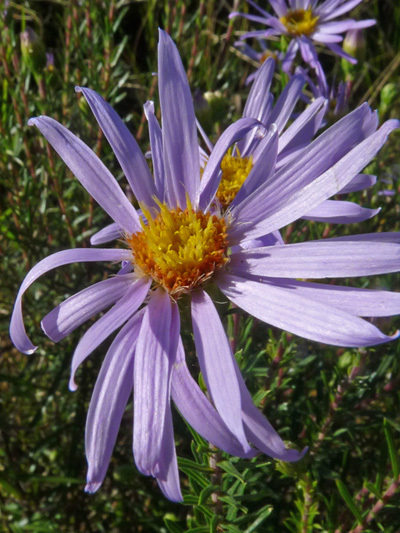 The Flax-leaved aster is declared vulnerable species in Quebec. Indeed although present in eastern United States, from Texas to Maine, in Canada we can only find it in New Brunswick where i's classified-rare- and in Quebec where one account 20 occurrences of the Flax-leaved aster. Only around the city of Trois-Rivières we can find 15 of these 20 occurrences. Proposed many times as floral emblem forthe city of Trois-Rivières but, unsuccessfully until now. The last of our Aster to bloom (september). If you spot a population of Flax-leaved aster (in Quebec), please contact the Centre de données sur le patrimoine naturel du Québec.